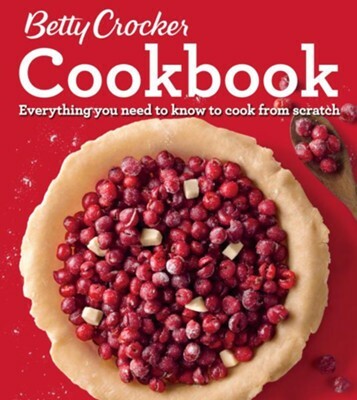 This one-stop resource bursts with kitchen information and guidance as only Betty Crocker can deliver. Learn to make a lattice crust, master a braise, can pickles, and even debone a fish via hundreds of how-to photos. Discover new ingredients organized by region, such as Middle Eastern or Indian, in vibrant ID photos. New and expanded chapters on one-dish meals, beverages, DIY foods, whole grains, and vegetarian cooking reflect what todays budding cooks want to eat, as do recipes such as Baba Ganoush, Short Rib Ragu, Pho, Korean Fried Chicken, Cold-Brew Iced Coffee, Cauliflower Steaks, Smoked Beef Brisket, Quinoa Thumbprint Cookies, and Doughnuts. And complete nutrition is included with every recipe. I'm the author/artist and I want to review Betty Crocker Cookbook, 12th Edition: Everything You Cookbook (Comb-Bound).